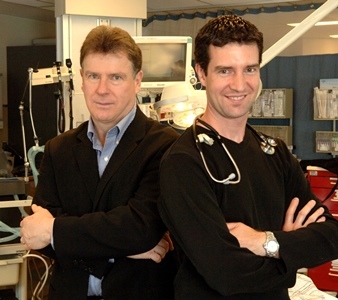 Two national projects led by Ottawa emergency medicine researchers received a total of $5.5 million from the Cardiac Arrhythmia Network of Canada (CANet) and matching funders. Dr. Christian Vaillancourt’s team* aims to help 9-1-1 communication officers save the lives of more people who experience cardiac arrest. About a quarter of individuals whose hearts stop suddenly will gasp for air, which can fool 9-1-1 callers and communication officers into delaying life-saving CPR. Dr. Vaillancourt’s team will test whether a piloted educational tool can help 9-1-1 communication officers recognize cardiac arrest when abnormal breathing is present, and improve survival rates across Canada. Dr. Ian Stiell’s team** aims to standardize care for patients with acute atrial fibrillation so that most patients with this irregular heart beat are treated in emergency departments and discharged home without needing to be hospitalized. Dr. Stiell’s team will test new guidelines they helped developed in 10 Canadian hospitals with the goal of decreasing hospitalizations for atrial fibrillation by at least 20 percent. See CANet news release for details. *Co-investigators: Ian Blanchard, Jamie Brehaut, Manya Charette, Jim Christenson, Kathryn Cyr Katie Dainty, Paul Dorian, Michael Feldman, Judah Goldstein, Stephanie Hodges, Colette Lacroix Shannon Leduc, Laurie Morrison, Matthew Spidel, Monica Taljaard, John Tallon, Venkatesh Thiruganasambandamoorthy, Sandra Zambon. Funding: $718,600 from CANet, $3 million in matching funds. **Co-investigators: Debra Eagles, Warren Cheung, Jeff Perry, Venkatesh Thiruganasambandamoorthy, Jeremy Grimshaw, Ian Graham, Monica Taljaard, Jamie Brehaut, Justin Presseau, Paul Angaran, Patrick Archambault, Clare Atzema, Kerstin de Wit, Marc Deyell, Frank Scheuermeyer, Alain Vadeboncoeur, Paul Atkinson, Ravi Parkash, Eric Letovsky, Kirk Magee, Eric Mercier, Judy Morris. Funding: $506,300 from CANet, $1.03 million in matching funds. Emergency medicine research is possible because of generous support for Research to Improve Patient Care at The Ottawa Hospital.